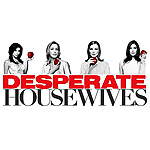 Who’s your fave Desperate Housewives Character? Who is your favorite housewife on Wisteria Lane? Who's your favorite man on Wisteria Lane? Who do you think Susan should be with? Do you believe that Gabi's new wedding gonna last?